Should it be stored in the fridge and taken out daily for usage and then kept back? Hermetically sealed (airtight) containers. If it's not airtight you will eventually end up with flour bugs and they will move into to your non-airtight cornmeal container, and anything else they care to infest that isn't locked up tight. The old metal tins or quaint crockery are not adequate to prevent infestation, and sooner or later you'll buy some bag of something that already has the bugs in it; they'll spread. I use plastic tupperware type stuff. It's cheap and effective. Beauty comes at a substantial extra cost. 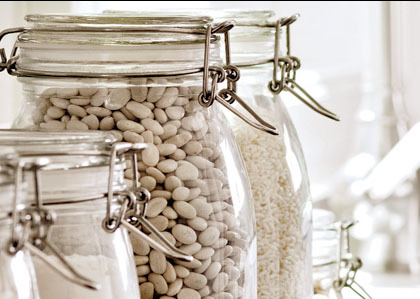 At home I use bail closure jars (for flour, and all dry beans, lentils, pasta,...). For short term storage, I use either the bag the flour comes in, or I transfer it to an airtight container, which I keep in a cupboard, not the fridge. Don't store daily use flour in the fridge, especially if you're making breads or pastries. Although it's best if all ingredients are at room temperature when you start in on a baking recipe, many of us will use eggs, milk, etc. right from the fridge. However, if you add flour to that list, you're going to wind up with a batter or dough that is so far off temperature that it won't mesh with the recipe's baking time and oven temp. They are lighter and easier to open and close than the glass jars. I store my large amounts of flour in an old gallon tin. I never have problems with bugs, I believe it is because I always throw in a couple bay leaves. Not the answer you're looking for? Browse other questions tagged storage-method flour refrigerator wheat or ask your own question. Food accidentally left unrefrigerated for up to 10 days — what needs to be thrown away?